Granulicatella species commonly known as nutritionally variant streptococci (NVS) are part of the normal oral flora and are found in the endocardium, dental plaques, dental abscesses, and endodontic infection. Severe complications may arise due to its ability to cause a variety of serious infections. The presence of Granulicatella species in spine or surgical site was never noticed or reported. Here, we present a rare case of G. adiacens in the muscular plane of L5–S1 vertebrae which were diagnosed radiologically and also microbiologically to give appropriate treatment to the patient for recovery. Post-operative surgical site infection (SSI) in spine surgery is a common complication, most commonly caused by Staphylococcus aureus. We encountered a rare case of postoperative SSI caused by Granulicatella adiacens, belonging to a species of nutritionally variant streptococci (NVS) which is a normal commensal of human mucosal surfaces inhabiting oral cavity, urogenital and gastrointestinal tracts, rarely causing diseases. Here, we report a rare case of postoperative SSI caused by G. adiacens in a 53-year-old female patient with known hypothyroidism, on treatment, and no other systemic diseases such as diabetes and hypertension. She was diagnosed with L5–S1 degenerative spondylolisthesis and was surgically treated with L5–S1 fusion via a posterior approach. One month postsurgery, the patient presented with severe back pain with discharge from the surgical site and on clinical examination, there was a swelling (10 cm × 10 cm) with purulent discharging sinus at the surgical site. 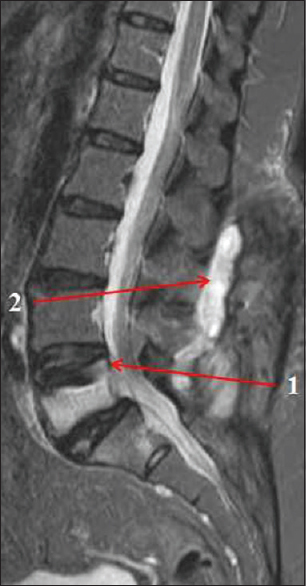 No sign of infection was noted on plain X-ray radiography, but magnetic resonance imaging showed the well-defined fluid collection in a subcutaneous and muscular plane in the lumbar spine which was hyperintense on the T2-weighted image 1 (WI) and hypointense on T1-WI [Figure 1]. Patient's complete blood profile showed hemoglobin level was 11 g/dL, white blood cell count was 11,800/μL, platelet count was 24.6 × 104/μL, erythrocyte sedimentation rate was 92 mm/h, and C-reactive protein was 11.0 mg/dL. Pus samples were examined microbiologically as described below. Pus sample collected from the site of infection was inoculated on 5% sheep blood agar. Cultures were incubated at 37°C in CO2 for 24 h. After incubation, the culture plates showed nonhemolytic, smooth colonies, and satellitism [Figure 2]a and [Figure 2]b. On gram-staining, the organism was found to be Gram-positive cocci. 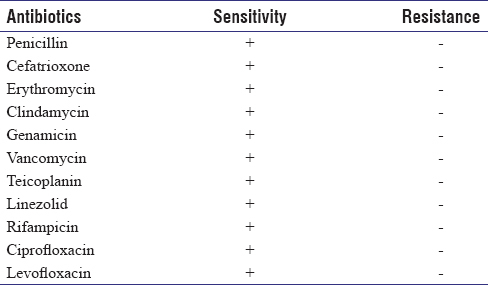 Antibiotic sensitivity test revealed susceptibility to aminoglycosides, fluoroquinolones, and beta-lactams antibiotics [Table 1]. The patient was treated with parenteral antibiotics for 2 weeks, followed by oral medication. Her clinical condition has then improved significantly. Postoperative SSI is a common complication observed in many patients, where S. aureus is implicated in most cases, but causative organisms such as G. adiacens is a rarity, especially in spinal infection. Granulicatella species are considered as a least common cause of infection. In our case, the causative agent was found to be susceptible to most antibiotics and on the administration of amoxicillin and clavulanic acid, the patient showed significant signs of recovery. G. adiacens is known to cause various infections such as endocarditis, osteomyelitis, arthritis, sepsis, etc., In summary, postoperative spinal infection due to NVS can be easily misdiagnosed when the blood-cultures are reported negative. NVS infection must be considered as a cause of infection if a patient with spinal infection shows positive Gram-staining and negative blood cultures. We wish to thank our pathologists, radiologists, and colleagues for helping us with the case study. Ruoff KL. Nutritionally variant streptococci. Clin Microbiol Rev 1991;4:184-90. Ruoff KL. Aerococcus, Abiotrophia, and other aerobic catalase-negative, gram-positive cocci. In: Murray PR, Baron EJ, Jorgensen JH, et al., editors. Manual of Clinical Microbiology. 9th ed. Washington, D.C.: American Society for Microbiology Press; 2007. p. 445. Murray PR, Rosenthal KS. Enterococcus and other gram-positive cocci. In: Murray PR, Rosenthal KS, editors. Medical Microbiology. 6th ed. Philadelphia: Mosby, Elsevier; 2009. p. 246. Frenkel A, Hirsch W. Spontaneous development of L forms of streptococci requiring secretions of other bacteria or sulphydryl compounds for normal growth. Nature 1961;191:728-30. Ohara-Nemoto Y, Tajika S, Sasaki M, Kaneko M. Identification of Abiotrophia adiacens and Abiotrophia defectiva by 16S rRNA gene PCR and restriction fragment length polymorphism analysis. J Clin Microbiol 1997;35:2458-63. Gardenier JC, Hranjec T, Sawyer RG, Bonatti H. Granulicatella adiacens bacteremia in an elderly trauma patient. Surg Infect (Larchmt) 2011;12:251-3. Bottone EJ, Thomas CA, Lindquist D, Janda JM. 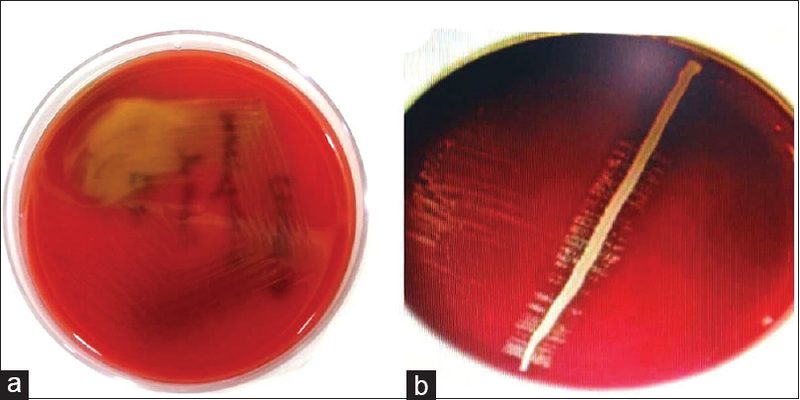 Difficulties encountered in identification of a nutritionally deficient Streptococcus on the basis of its failure to revert to streptococcal morphology. J Clin Microbiol 1995;33:1022-4. Woo PC, Fung AM, Lau SK, Chan BY, Chiu SK, Teng JL, et al. Granulicatella adiacens and Abiotrophia defectiva bacteraemia characterized by 16S rRNA gene sequencing. J Med Microbiol 2003;52:137-40.